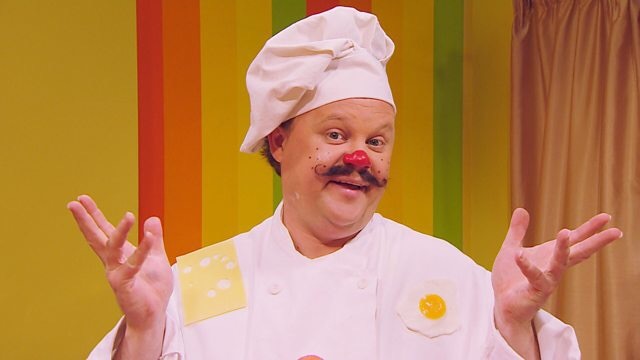 We’re big fans of Mister Maker here and love any activity that involves making a mess. It’s the cleaning up afterwards that we’re not so fond of… I love getting creative with the boys but, sometimes the thought of cracking open the messier materials such as paints, glue and glitter, gives me an “art” attack. 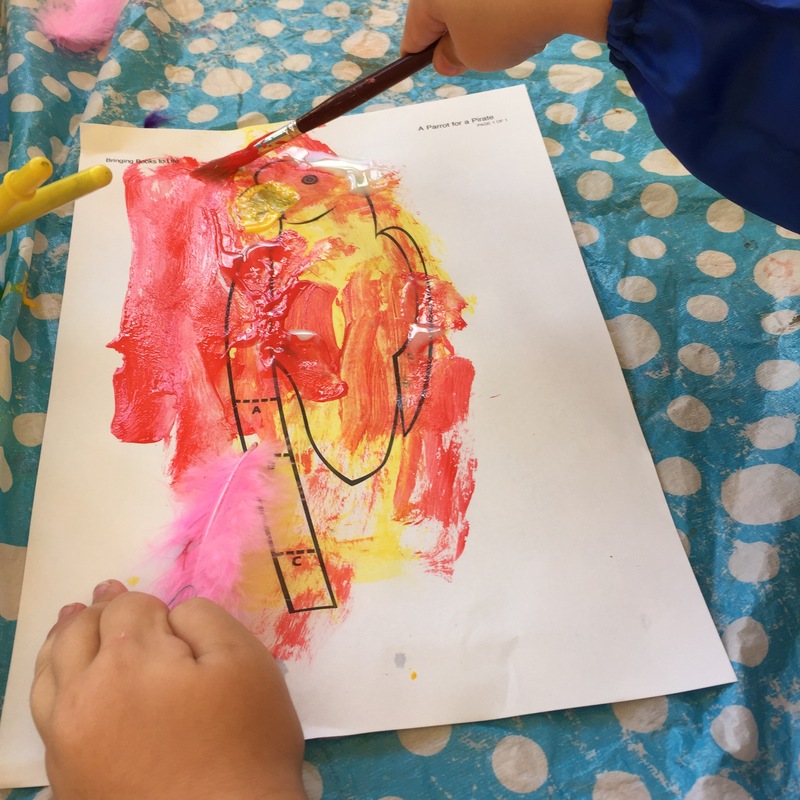 So, we jumped at the chance to try an art class specifically aimed at toddlers, based in a church hall in Reigate, Surrey. I often struggle finding classes suitable for both my boys. Traditional baby classes, suitable for the 10 month old, don’t tend to welcome older siblings, as they are deemed too disruptive. Whereas, classes aimed at my 3 year old, aren’t always terribly baby-friendly. So, when I spoke with the team at Busy Lizzy Reigate and they recommended Mini Monet, due to its suitability for all ages, I was really, very excited!! True to their word, the class was aimed at babies from “walking” to age 4. I have a confident cruiser, which is close enough, but younger baby siblings would have also been made welcome, as a baby playmat and toys had been set up to entertain them in advance. Charlotte, who led the group, started by introducing this week’s theme: pirates! An instant hit with Big Brother! 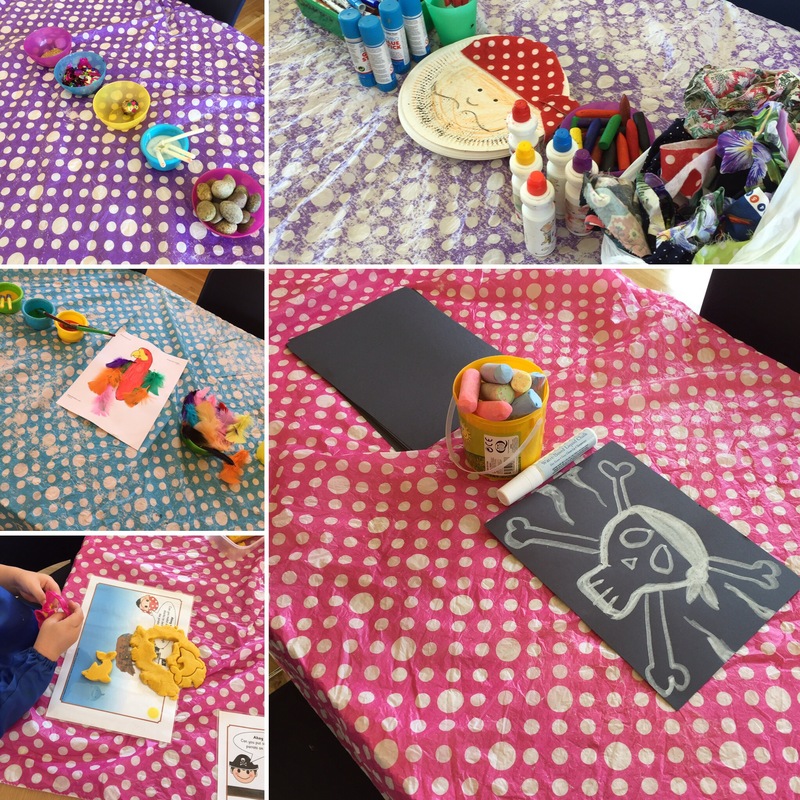 She had set up five craft stations around the room, for the children to try different activities during the course of the class: feathery parrots; paper plate pirate faces; chalk skull & crossbones; treasure pebbles; and playdoh fun. 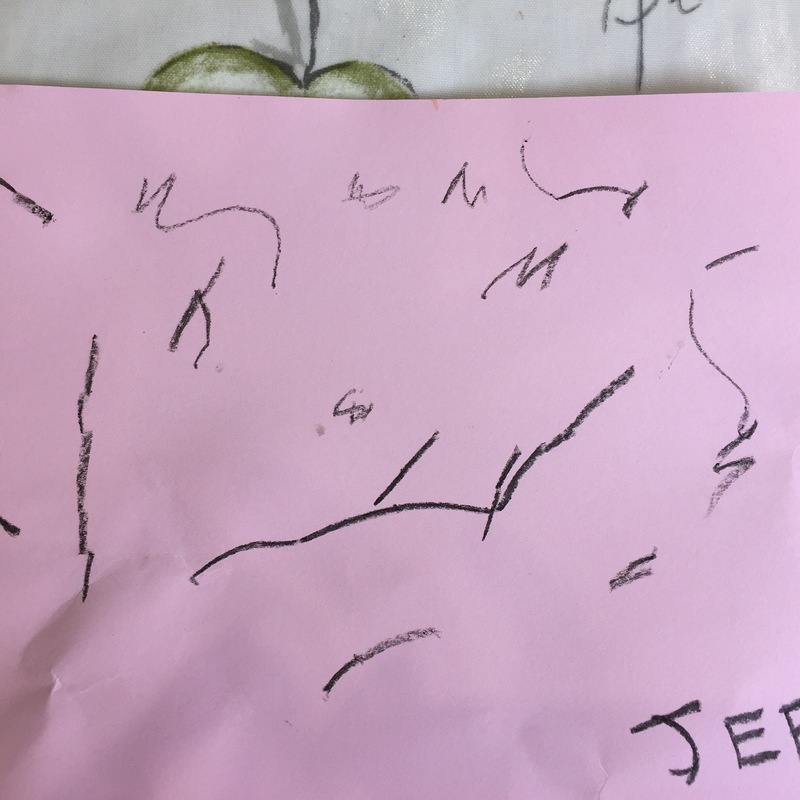 We managed to get around most of the activities within the hour (despite a hearty meltdown from my big boy halfway through, because he accidentally painted his parrot’s beak the wrong colour), and Little Brother had a go at sticking and painting too. We loved the “goodie bags” that we were given at the end, to fill with everything we’d created – such a nice touch. The boys were completely taken with the pirate theme and we made more parrots and treasure at home, later that afternoon. Charlotte was so patient and kind with all the little ones and explained to me that Busy Lizzy is a family club that you can join to gain access to a whole range of classes for pre-schoolers. These include fitness classes for mums with babies in tow; baby classes for non-walkers; and toddler classes (many of which are suitable for younger siblings too). 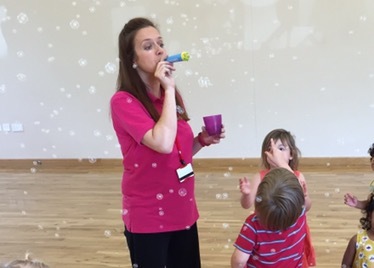 I particularly like the sound of the Fitness Skills & Drills (walking – 4 years), as well as the Funtime French classes (2-4 years) and the Hip Hop Tots dance classes (2-4 years) – a welcome change from the typical music & rhyme classes that you see everywhere. Having just returned from a holiday in France and successfully mastered “Bonjour”, “Merci” and “Pain au Chocolat”, I’d love to introduce a second language to the boys. And as my 3 year old is absolutely convinced that he will need it when he meets Chef Tumblé one day, he seems rather keen too. We love the concept of the family club and the idea that you can pay as you go, pick and mix, or have unlimited monthly access to as many classes as you like. We love that the boys can participate together in many cases, without being segragated by age. We love that the beautiful creations can come home with us but the mess stays there. We love the diversity of the classes and the lack of commitment to coming every week (you won’t lose out if someone had a bad night’s sleep and needs a duvet day). 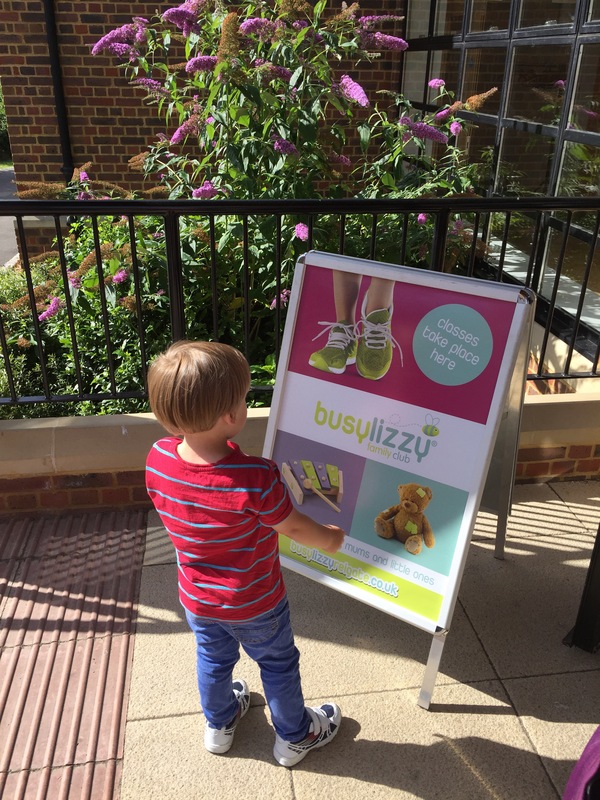 Busy Lizzy operates three pricing plans: unlimited class attendance from £79 per month; pick & mix of up to eight classes per month for £56 per month (£7 per class); or pay as you go bundles for £65 for eight classes (£8.12 per class). All credits rollover if unused, so there’s no penalty for missing a week. Plus, the club has a handy app which conveniently handles bookings for all classes from your smart phone.